When the Islamic State overran the Iraqi town of Qaraqosh last August, one of the priests there jumped into his car and joined the exodus of Christians on the road east in the hope of reaching the safety of Kurdish-controlled territory. Little did Father Bashar Kthea, a Syriac Catholic priest, know that for the next three months that car would be his home, the place where he would sleep, eat and keep his few possessions. He now lives with fellow priests and is ministering to more than 1,700 predominantly Syriac Catholic families who occupy a part of the refugee camp at Ankawa, near the Kurdish capital of Irbil, which has become known as the "Youth Center." It must have struck him that their present situation is little better—and in some ways perhaps worse—than his own nearly a year ago. 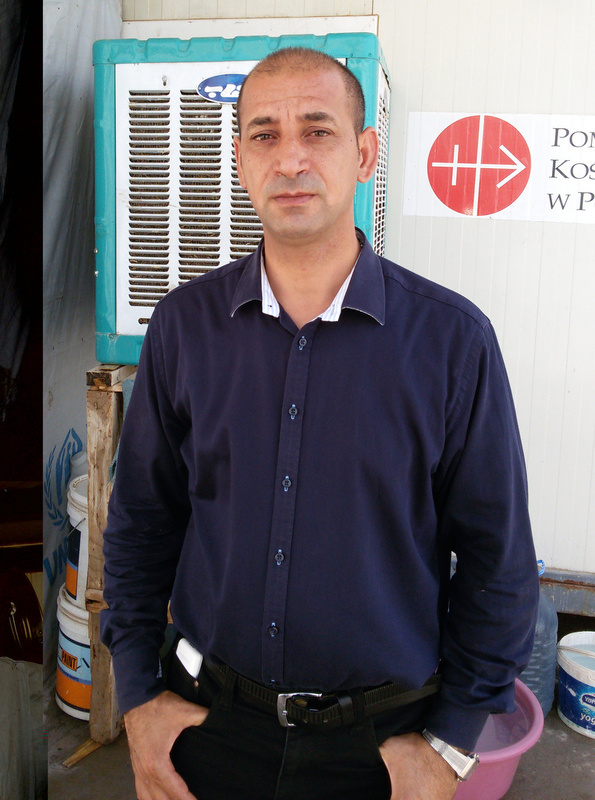 The 39-year-old priest's witness of the squalor and frustrations that Iraqi Christians continue to face after nearly a year in the camp was relayed to Catholic News Service through fellow refugee Sahar Mansour, a Chaldean Catholic from Mosul in a July email. Father Kthea finds that refugees in the Youth Center live in over-crowded single-room caravans, or trailers, usually averaging about eight occupants. Very often, two smaller families will be made to share one trailer, where all privacy is lost and there is little chance to speak freely among themselves. Most of the occupants sleep on the floor because there are neither enough beds nor any space to put them. When any of the adults want to change clothes, it usually means that everyone else must leave the trailer. In situations for families with babies, crying causes nearly everyone to lose sleep unless a parent takes the child outside. Family members spend most of their daytime and evenings in the caravans because employment opportunities are few. Those who have found work at times complain that the local Kurds who recruited them declined to pay for their labor. Instead, they remain almost totally dependent on overseas aid and upon the church, though some are beginning to lay out stalls selling goods at prices lower than the local stores, an indication perhaps of a burgeoning black market. Sahar wrote that Father Kthea explained the lack of work, particularly for the young, was creating "moral corruption, which was not known before." In such cramped conditions, Father Kthea reported that previously strong marriages are increasingly under pressure with husbands and wives "losing patience" with each other, while neighbors begin to grumble, gossip and give in to envy. A sense of hopelessness has engulfed even the young, including university students who can no longer study and engaged couples who hoped to marry but have effectively found themselves homeless. "The majority of the young people are thinking to not stay in Irbil anymore and they do their best to flee," Sahar wrote. "They tell me things like there is no future here and they can see no future, (they say) that 'we lost one year from our life and that life is important, valuable and it is worth living, but not to live it like this.'" The caravans have no toilets or running water, meaning the displaced people must use common facilities for showering or using a lavatory. The arrangement often results in long lines of women dressed in pajamas, with some unable to wait long enough to use a toilet, Sahar reported. Nor is there air conditioning in the caravans, leaving occupants to swelter in temperatures as high as 125 degrees. They fan themselves with anything they can find -- usually a kitchen tray or a wad of paper. "When you talk to Father Bashar, you notice that he is fatigued, exhausted," Sahar said. "You can easily notice the bitterness in Father Bashar's face or in his voice, but he works with total dedication." "He always says that we are created in order to work, that we are soldiers of Christ, that we want to cultivate love and peace, that we want future generations to live better than we lived, and that we do not want to inherit the culture of violence."